Our head and neck are held up by a combination of muscles and bones. These bones are called vertebrae and protect our spinal cord. In our neck, we have 7 cervical vertebrae, that support our head. Neck injuries can be a little scary, considering what the muscles and bones are protecting. Cervical injuries can range from sprains, strains, to vertebral fractures; these injuries can occur as either traumatic or non-traumatic. Like most injuries, surgery may or may not be indicated; we have many cervical orthoses for any need or injury. Give us call or stop by with your prescription and we can help you out! 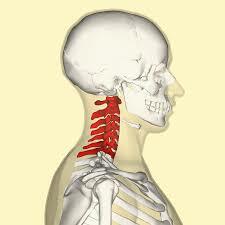 CERVICAL SPRAIN/STRAIN: Both muscles and ligaments support our neck and protect the spine underneath. A sprain is an injury to the ligaments of the spine and a strain is an injury to muscles surrounding the spine. Most of the time a sprain/strain will occur because of forceful trauma to the neck area causing the head/neck to move quickly. The symptoms associated with the cervical sprain/strain are pain, muscle spasms, and a decrease in range of motion. Surgery is typically not indicated for this injury but a cervical brace can help the muscles heal. HERNIATED DISC INJURY: In between each vertebrae of the cervical spine there is an intervertebral disc that helps cushion the spine between the vertebrae. The disc is made up of an annulus (outer border) and the nucleus (middle of the disc, surrounded by the annulus). A herniated disc is when the nucleus is pushing through the annulus and can apply pressure to the nerves. Symptoms of a herniated disc are pain down the arm, weakness in the arms, tingling, or burning in the shoulders. Surgery is sometimes indicated but symptoms can be resolved through rehabilitation, bracing, and/or home therapy devices. CERVICAL FRACTURE “BROKEN NECK”: One or more of the 7 cervical vertebrae can become fractured due a to a high impact trauma or force to the head and neck areas. There may be some pain at the fracture site but you may also experience numbness and tingling in the shoulders and arms. Any type of heavy trauma to the head and neck area with pain needs to be examined by a physician; they will be able to determine the severity of the fracture and determine the plan of care. Depending on the type and severity of fracture you may or may not need surgery. A brace may just do the trick! TORTICOLLIS: Torticollis is a cervical condition the affects mainly children but can affect some adults. There are two types of torticollis: acquired vs. congenital. A patient with torticollis will present with their head tilting to one side. ACQUIRED TORTICOLLIS: Usually a result of a mild injury to the cervical muscles or the spine itself causing the sternocleidomastoid (SCM) muscle of the neck to spasm and shorten. If the torticollis is a result of a trauma you need to have your neck examined by a physician; same goes if you have a fever. Most of the time torticollis can be treated with stretching/traction and/or bracing. CONGENITAL TORTICOLLIS: Congenital torticollis is present at birth or occurs very shortly afterward; within two months of birth. There is really no known cause of this type of torticollis but one theory is the positioning of the child in the womb and their head being tilted a certain way, causing the SCM to shorten. The child would have a limited range of motion and can lead to plagiocephaly, due to laying on the same side when sleeping. If this is the case a cranial remolding helmet may be prescribed. Congenital torticollis is treated very similarly to acquired torticollis; the child would have to have their neck muscles stretched throughout the day and may have to go to physical therapy. Bracing can be prescribed but is not common due to the age of the patient. Our specialists can answer your neck injury questions.